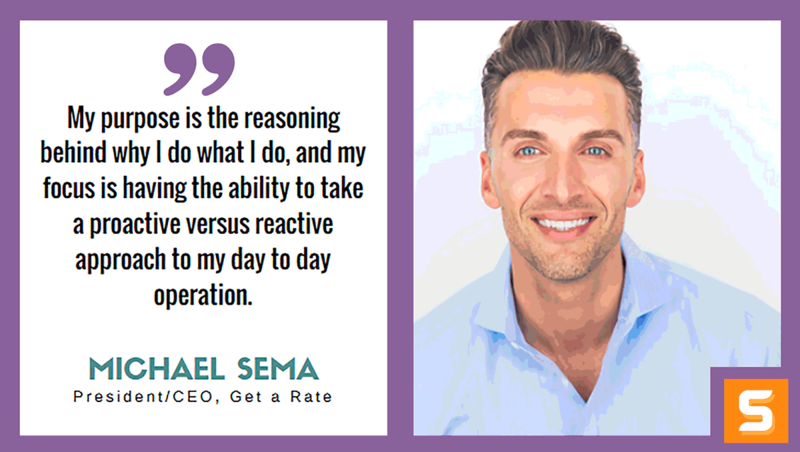 Michael I. Sema, CEO at Get a Rate, is a mortgage lending visionary and trailblazer. He started his career in 2004 like most loan originators at your typical NJ Mortgage Company to learn about home financing fundamentals and process. His tenure there was stellar starting as an account executive to a top producing branch manager in the nation for the entire company in a matter of two years. After gaining invaluable knowledge and experience, in 2012 he decided to build a business with the client experience in mind. Michael believed in offering legendary customer service and guidance all the while always actively seeking low rates and fees for clients. Plain and simple, he wanted to create a preferred customer experience that was effortless and fulfilling at the same time. His vision as the President of Get a Rate has adapted over the years yielding to consumer behavior where the customer can “get a rate” at their convenience any time, anywhere. Not only can they secure competitive rates, they can also gather all the information needed to choose the right home loan option for their specific situation and goal in mind. Michael is proud to have helped thousands of New Jersey homeowners in achieving affordable home ownership. Today, he continues to educate homebuyers and help them accomplish their financial goals while paving new ground in the mortgage industry. In this interview with Startup Savant, Michael shares his vast experience in the real estate and mortgage industry. He also emphasizes the reason why he started his company and outlines some insights on how to serve clients/customers better. Develop a sound business plan where you are overestimating expenses and underestimating revenue. As an entrepreneur, success is your duty, obligation, and responsibility. It’s not something that’s acquired; it’s something you make. What motivated you to start Get a Rate? How did the idea come about? The single motivating factor that inspired me to start Get A Rate was my inability to accept and believe in our nation's broken banking system. The current banking system follows a proven to fail, old school approach to employee compensation by extrinsic motivating factors like commission, bonuses, rewards and more. The current Banking system is structured in a way that rewards top executives (who are responsible for implementing company products, rules and regulations) and front end sales representatives (who advise clients directly) based on the carrot and stick mentality. Most companies and commissioned based sales reps in our sector are trained and motivated to believe that more is better. However, the “more you do, the more you make” approach has crippled our economy and continues to take advantage of hard working Americans every day; this is where the problem lies. So we decided to make a change and focused our belief in being better instead of doing more to make more. Our fundamental belief in living a better life has given us purpose to not only transform but innovate a broken banking system. By providing true unbiased advice, we’ve figured out a way to not only educate but empower our clients in making the right decision in homeownership. As an entrepreneur, I’ve focused on developing my analytical, cognitive, emotional and spiritual intelligence and will continue to do so. Analytical Intelligence is understanding how systems interconnect and the roots of an organization. Cognitive intelligence is evolving skills like information comprehension, conceptualizing possibilities, problem solving and making strategic decisions. Emotional intelligence helps entrepreneurs lead companies with empathy and recognize yours and others’ needs or feelings. But having a high level of analytical, cognitive and emotional intelligence is never enough. The last piece of the puzzle is Spiritual intelligence, which is when we access our deepest meanings, drive, values, purposes and motivations. My drive as an entrepreneur is the inner fire that pushes me to work those 14 hour days 7 days a week. My purpose is the reasoning behind why I do what I do, and my focus is having the ability to take a proactive versus reactive approach to my day to day operation. Would you recommend new entrepreneurs use a business plan software so they can focus more on starting a business and less on document formatting? I would highly recommend that new entrepreneurs develop a detailed business plan either by using business plan software like bplans.com or even hiring a firm that specializes in business plan development. A comprehensive business plan should have an overview or executive summary, a business description, marketing strategies, competitive analysis, design and development, operations and management, and financial information. I’ve personally started and operated four multi-million dollar businesses and the only one that failed was the one that did not start out with a business plan. Our competitive advantage is that we truly help people. We help them by not selling, but by servicing them and slowing things down so they can truly understand what they’re signing up for instead of pushing them. We’re also extremely competitive with our rates and products, and it’s because we don't have high margins built into our rates to compensate for commissioned based sales reps. By offering superior service, competitive rates, and true unbiased advice, our company has a 39% conversion rate compared to the rest of the industry, which averages 4%. In a service-oriented business where the average process to purchase a home can take anywhere from 30 to 60 days, yes we’ve had clients who’ve expressed disappointment. I truly believe the best way to handle a disappointed client is to remember that the client is always right, even if they're wrong. And if they're wrong, you have to make them feel right. You can do this by apologizing first, saying “I’m sorry to hear about this issue.” Even if the client is wrong - trust me an apology goes a long way. Empathize with them - Make sure they know that you understand what they’re experiencing and how you’re going to help. Listen to your client - Allow them enough time to express their thoughts and feelings. Make sure to get to the heart of the problem; it’s the only way to figure out a solution. And finally, work on a solution. Even if you don't have a solution at first, let the client know that you are on their team and that you will not stop until you’ve turned all stones to come up with a solution. Operating under a business entity (LLC, Corporation, etc) is important for asset protection. Did you register your business yourself or use an online incorporation service like LegalZoom? I registered the company myself, but I’ve heard of others using services like LegalZoom and having good results. When times get tough, what motivates me is probably purpose and fear. My purpose to accomplish the goals I’ve set to achieve as an entrepreneur no matter what the obstacles are and my fear of failing my family, team, and myself in my mission to make a difference. Is there a type of marketing that has worked amazingly for Get a Rate? If so, how did you stumble upon it? We’ve been extremely lucky that 58% of our business is through B2B referrals and word of mouth. But the top marketing channels that we use are Facebook and Google PPC campaigns. However, it wasn’t easy - it’s taken us years to structure profitable high converting campaigns that not only turn into clicks or apps but most importantly, profit. Content Marketing, Email Marketing, and Reputation Management are also extremely important strategies in your marketing mix. In this day and age, people can easily access information and do their due diligence in a saturated market. If you can provide intangible value to your target audience with your product or service, you will stand out from a sea of options. Today’s entrepreneurs not only have to understand and operate their day to day business but also learn how to market their product or services by understanding their audience, learn how to design specific marketing campaigns/landing pages, constantly review analytics against key performance indicator metrics and much more to be successful in marketing. We’re huge believers of every entrepreneur keeping their business’ finances under control. How do you keep Get a Rate books in check? Absolutely. No matter who’s handling the accounting or payroll, I’m still involved in every step. As a business owner, I review the books sometimes daily or weekly and in-depth monthly. It’s imperative to review conversion metrics to discover vital information that can help you run your business better and make more money. Develop a sound business plan where you are overestimating expenses and underestimating revenue. Make sure you understand you and your business. Don’t wear too many hats. As an entrepreneur, you are naturally the leader. Leadership is mostly about change and transformation, and management is about efficiency and implementation. You are the architect and builder and your managers ensure that the system runs smoothly. Having too much leadership without enough management is dangerous. The company will lack efficiency, operational discipline, and organizational capacity. So having the right team to support and help you implement your ideas is extremely valuable. As an entrepreneur, success is your duty, obligation, and responsibility. It’s not something that’s acquired; it’s something you make. Success doesn’t just happen to you; it’s something that happens because of you and the actions you take. So become obsessed about your business, and I promise you that you will become great at it. Be sure to follow the home expert on Twitter, Facebook and Linkedin!